I love Halloween. There’s just something about the “air” of the season and besides, is there anything more fun that being able to dress up as someone or something that you’re not? Buying costumes can be so expensive though. Really, the last thing I want to do is spend $20 or more on a costume that my Emma will only wear once. In other words, I am a huge fan of DIY Halloween costumes. Sure, there are some that are over complicated and take a ton of time, but the best ones? They’re quick, easy and clever. 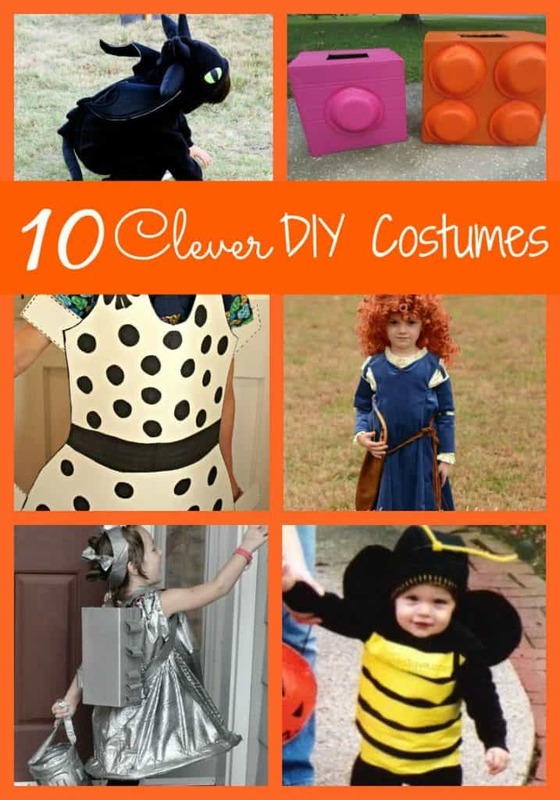 These 10 clever DIY costumes are some of my favorites for kids. They’ll all super cute and easy to do. I’m sure you’ll love them as much as I do! If making your own Halloween costume isn’t your “thing,” check out HalloweenCostumes.com – They have a HUGE selection and they’re awesome costumes! Thanks so much for featuring my Ninja Turtle costume! I think my son is going to love the Mega Blocks costume for this year! They grow up so fast don’t they!